There are many who hate what I write, as I am sure most of you know. Yes, I have many detractors and sometimes I will respond to their contentious comments and others will tell me that I am not kind when doing so. At times, I wonder why they want to spend so much time writing about and against me on their evil sites where all they do is gossip and slander those they hate. In Titus, I found all of my answers! For there are many unruly and vain talkers and deceivers…Whose mouths must be stopped, who subvert whole houses, teaching things which they ought not…but unto them that are defiled and unbelieving is nothing pure; but even their mind and conscience is defiled. They profess that they know God; but in works they deny him, being abominable, and disobedient, and unto every good work reprobate. I have been scolded by a few women who tell me that I must speak to them kindly and in love. Speaking the truth in love rarely comes across as kind or loving to those who hate the truth. For one thing, truth sounds mean and harsh to them but speaking truth to them is the most loving thing that I can do in hopes that the Lord will plant some seeds in their souls that may one day sprout into repentance and belief in Almighty God. These vain talkers will scold me for not being open to ways that are contrary to the Bible and continue to badger me telling me that I hate women, teach dangerous things, and am a cult. Often, the reason I don’t rebuke them is because when I do, instead of quoting scripture to tell me where I am wrong, they will attack me personally. If they can’t back up their arguments with truth, they attack the messenger and this is fruitless. Therefore, I am quick with my delete, ban, and hide button on Facebook. As I have mentioned before, I am not going to allow them to poop on my Facebook page, Instagram, YouTube, or blog. No, these aren’t open forums as they try to convince me; my blog is a teaching blog and I don’t want those who hate the truth to draw others away. I pray that they will one day repent since God’s Word doesn’t come back void, but it’s not my duty to allow them a “voice” on my stuff. 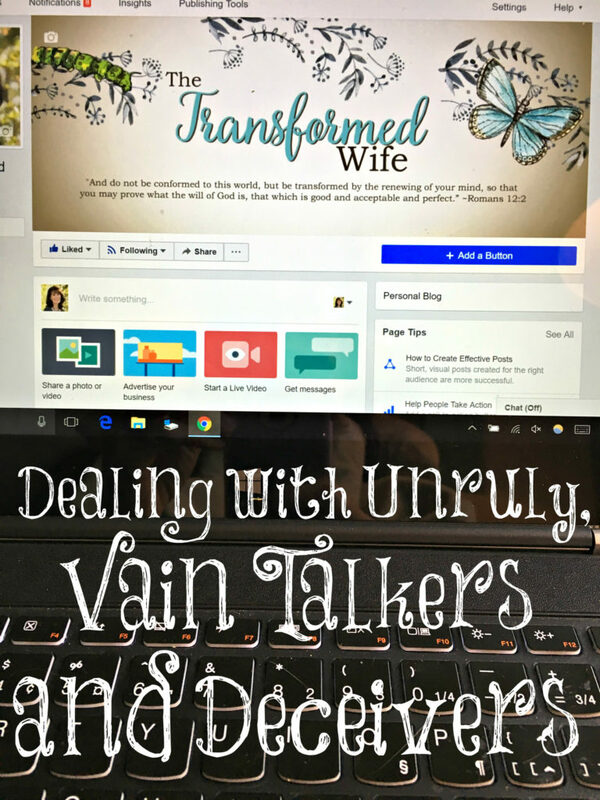 I have seen godly men and women shut down their blogs because of vain talkers. What I have noticed is these godly bloggers allow every and all comments to remain on their blogs and/or Facebook page, even the cruel and heartless ones. We are commanded to dwell on the lovely and the good, thus when we dwell on the bad and mean, we are disheartened and quit. Therefore, my encouragement to all of you who have blogs is to be diligent about what you allow on your blog, Facebook page, Instagram, etc. I have NO problem deleting, banning, and hiding comments if they are not beneficial in any way but only used to scold and belittle. Their entire purpose is to kill, steal, and destroy, just as it is Satan’s so don’t give up; for greater is He who is in you than he who is in the world. Mark them which cause divisions and offenses contrary to the doctrine which you have learned and avoid them. Oh yes, that took reading it all through to get to the oh yes but OH YES! Thanks, Lori, for your faithfulness in teaching younger women. Even though I don’t comment on every post, I visit your blog daily (the only one that I do that with) and am constantly refreshed and encouraged to fight the good fight. May God strengthen and protect you and your blog from the evil one….press on! Thank you, Holly. If they hated our Savior, we can expect no less but thankfully, He has already won the victory! My goodness I can’t think of one thing that would cause such anger in these people. NOT ONE THING. I even went back and read several of your older posts and, well, I cannot imagine what people are so upset about. I love to discuss your posts with my friends and they agree, there is really not one thing to be so angry about. I think I have a few years you since I am eighty three years old. So if there was something I thought was amiss in your writings, I might try to kindly express that but, really, I find nothing worthy of that kind of discussion. Just my opinion. Have a great day, dear Lori. Thank you, Mary Esther. And some have kindly expressed where I may be off biblically and I always consider them and have sometimes changed what I believe because of it but I do always go to the Word and search it out for answers along with discussing things with Ken. They hate submission because they falsely believe it will lead to abuse. They hate the fact that women are to be silent in the church and not preachers/teachers of or over men. They hate it when I encourage women who are married to disobedient husbands to follow 1 Peter 3:1-6 and these are just a few of the things they hate. I love your posts Lori. I find them to be so encouraging in my journey of being more submissive to my husband. If I wanted to justify why I don’t need to be submissive, there are plenty of places I can go to find excuses. On your blog, I want to learn why submission is important, and what it looks like. Thank you, KAK. 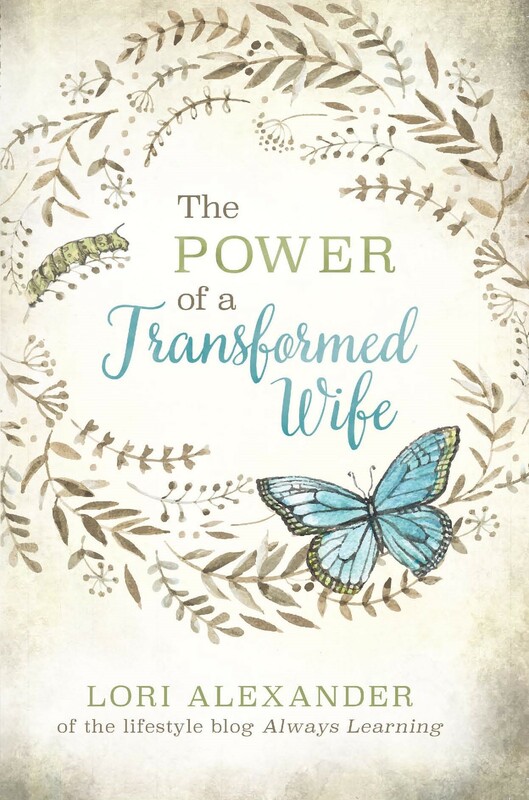 I write to exhort, rebuke, and encourage myself, too, since I want to be a wife that God has called me to be. I totally agree! Keep writing, Lori. I learn so much. I have been reading your blog for a few weeks now and it has been such a blessing to me! I have been studying everything I can about becoming the wife and mom God wants me to be and your posts have been very helpful. I’m just getting started with my new blog and I find myself nervous about what I post because I dread the thought of negative feedback. I actually almost gave up on it a few weeks ago, but my husband has encouraged me to continue since it’s a hobby that I really do enjoy. I agree with you 100% about deleting negative comments, etc., I think it would draw attention away from the truths you are trying to teach here. Wow. Thanks for sharing that. I had no idea. I am so very careful where I spend my time online – my husband reads and approves and I only go to places he checks out first. He loves your blog and says a lot of good sensible things are posted here. That the Lord may bless Lori and keep Lori, protect Lori, sustain Lori and guard Lori. The Lord make His face shine upon Lori with favor, mercy and grace. May the Lord be gracious to Lori, surrounding Lori with loving-kindness. The Lord lift up His countenance, face upon Lori with divine approval and give Lori Shalom, peace, a tranquil heart and life. Keep on doing Lori’s good work, the devil can not stop us. 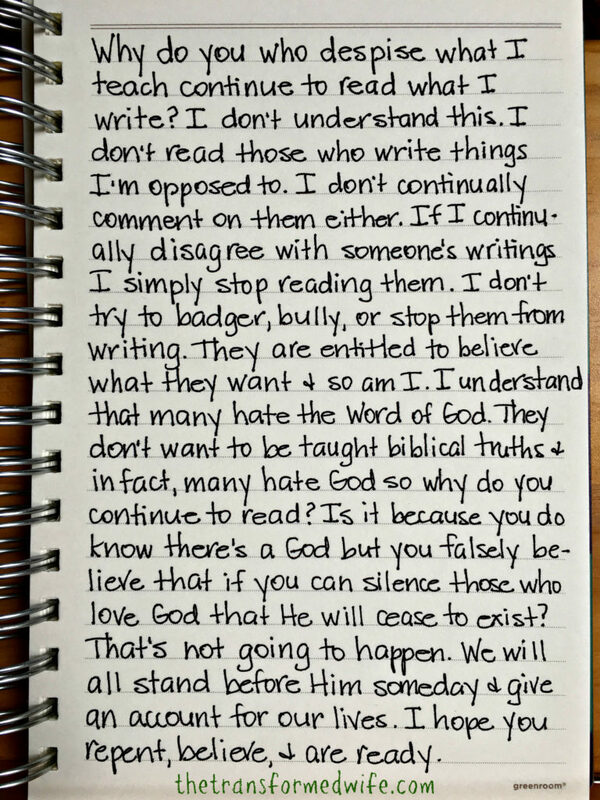 Keep on teaching and preaching and writing on this blog. What about this verse: “Brethren, if a man be overtaken in a fault, ye which are spiritual, restore such an one in the spirit of meekness; considering thyself, lest thou also be tempted.”? Many vain deceivers in the world recieving each others they were liars from the start.we love the truth we always did we will we are the truth don’t listen to their lies.show them live walk in humility and Thier evil father has no claim over us the righteous elect of the living God. I don’t have Facebook really don’t know what the topic was on, I was studying on Titus 1 :10 -16 so whatever it’s worth don’t STOP,people needs to read the truth , at least one way.